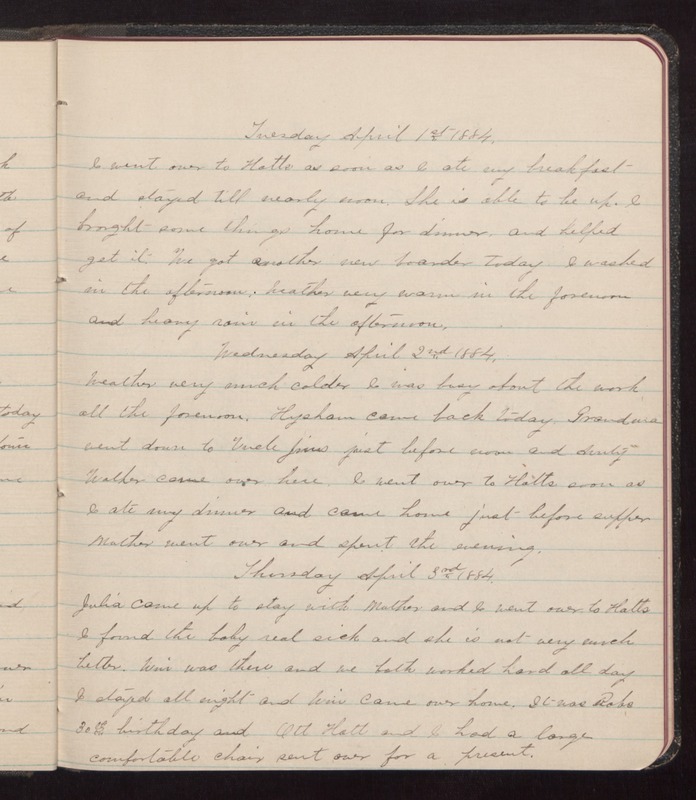 Tuesday April 1st 1884 I went over to Hatts as soon as I ate my breakfast and stayed till nearly noon. She is able to be up and brought some things home for dinner and helped get it. We got another new boarder today. I washed in the afternoon. Weather very warm in the forenoon and heavy rain in the afternoon. Wednesday April 2nd 1884 Weather very much colder. I was busy about the work all the forenoon. Hyshan came back today. Grandma went down to Uncle Jims just before noon and Aunty Walker came over here. I went over to Hatts soon as I ate my dinner and came home just before supper. Mother went over and spent the evening. Thursday April 3rd 1884 Julia came up to stay with Mother and I went over to Hatts and found the baby real sick and she is not very much better. Win was there and we both worked hard all day. I stayed all night and Win came over home. It was Robs 30th birthday. Ott Hatt and I had a large comfortable chair sent over for a present.